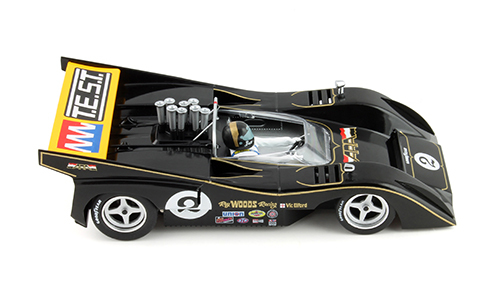 With the addition of just one larger magnet atop the standard bar magnet, the well detailed test car was turning laps within 0.1 seconds of my best current Can-Am racer made by Revell Monogram. With the proper silicone tires, this will easily be among your quickest, best-handling cars, and with little prep time. Slot.it uses metal wheels and axle spacers, plus a metal small drive gear for longer life and better power and rolling ability. Yet its pricing is only slightly above some less racy makes. Beyond its performance, which is key, the McLaren features stellar looks and detail, such as a full driver figure and labeled Goodyear tires. For the record, this version is a replica of the car that noted sports car and LeMans racer Vic Elford drove in the season ending Leguna Seca Can-Am race in 1971. This is a fast and user friendly car that looks like, and is, a serious racer. It’s more than just a car for kids goofing around on the basement track. My experience is that Slot.it cars are among the best available currently!